I call Jim Acher at Ocean Independence in Palma for more details of his latest central agency for sale, the 32m motor yacht Trilogy, and almost his first words are that she represents amazing value for money at €1.2 million, VAT paid. Trilogy was built by the USA's Tempest yard in 1990 and had a full refit in 2005 followed by a repaint of the entire exterior in 2006. 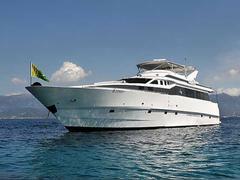 A closed pilothouse superyacht, she accommodates eight guests in a master, VIP and two twin staterooms and cruises at 13 knots.